UPSC Civil Services / IAS 2019: Union Public Commission Services (UPSC) will be released the notification of Civil Services 2019 exams in the month of January 2019 for the recruitment of various civil services like Indian Admission Services(IAS), India Police Services(IPS),Indian Foreign Services (IFS), Group A, Group B and other essential services for the year 2018-2019.UPSC recruits the various central civils services and designations of the country successfully for the past few years.The UPSC will be released the UPSC Calendar for every year for recruit the candidates in various positions and it will be very useful for job aspirants.So eligible candidates who are seeking for such as IAS,IPS,IES and other services can apply online mode only.To know more details regarding UPSC Civils / IAS 20189Registration,Application form,Exam Date,Fee,How to Apply and other details given below. Candidate must know the eligibility criteria before going to apply.The following eligibility conditions are required to appear the UPSC Civils Services Exam. The UPSC Civil Serices (IAS) written Exam will be conducted in two stages namely Preliminary & Main Exam.Preliminary exam is a qualifying exam for mains.To qualify the exam,Candidate must obtain the minimum cut-off marks in each section decided by examination authority. 1.Exam will be conducted in offline mode in duration. 2.Exam consists 3 papers and two compulsory papers with each paper of 200 Marks. 3.Each question will be 1/3 Mark penalty for wrong answer choosing. 1.The Mains exam will be conducted in Descriptive test mode. 2.It consists of 9 different papers and paper-1 & paper-2 are necessary for all. 3.Remaining will be optional subjects. Aspirants for UPSC civil services like IAS,IPS,IES and other need to fill Application form online through official website i.e www.upsconline.nic.in.Before going to apply applicant must know the instructions carefully by visiting the official website.Eligible candidate should be apply online only ,there is no other mode to apply.Here we are providing procedure to complete the “IAS Application form 2019” through the online. Candidate need to register for both PART-1 & PART -2 to complete successfully. 3.Select PART-1 for registration with applicant details such as Name,parents name,date of birth,permanent address etc. 4.After registration for part-1, candidate will receive a registration number. 5.Now the candidate login with registration no. PART-2 Registration and candidate should enter the required information in the form. 6.Upload candidate scanned Photo & signature in required format. 7.Finally pay the fee (Rs.100/-) through the Credit/Debit/Internet banking or SBIetc. 9.Take printout of the application for future reference. Dimensions should be in (lessthan 40kb) JPG/PNG format. Size must be (less than 40kb) in JPG/Png format. The Admit Card will be available on UPSC website on May 2019 tentatively.Aspirants must download Hall ticket through the online only.The examination authority will not send the the hall ticket by post.So candidate must visit the official website and must enter the candidate registration number to download the Admit card. The UPSC Civil Services exam result will be released for preliminary and main exams separately.The preliminary result will be available in the month of August 2018 and Main exam result will be declared on January 2019.After successful completion of Candidates can check their result by the candidate roll no. in PDF format file. 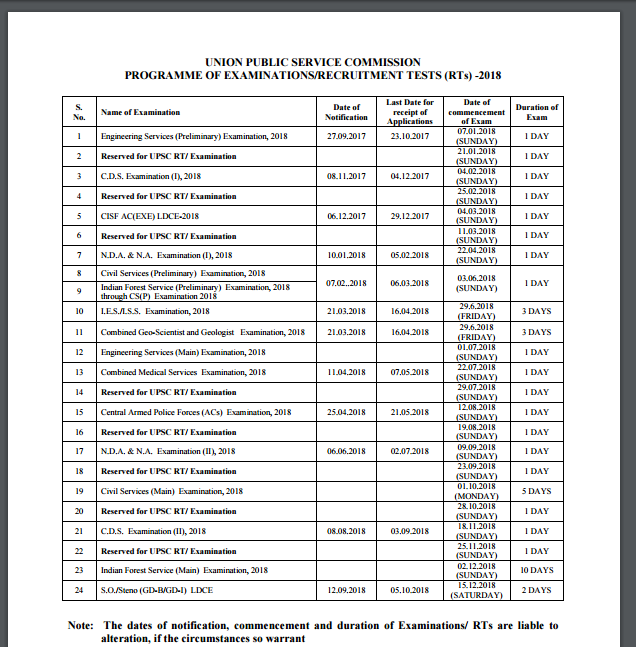 The cutoff marks for Civils/IAS exams for will be declared by UPSC after the examination and interview.Candidates will be short listed based on cutoff marks by UPSC depending upon number vacancies in particular field.